Galangal root has a aromatic scent and is found in many Thai dishes, most famously in Chicken Coconut Soup (Tom Kha) and Tom Yum soup. Full of vitamin B1, B2 and C, calcium, iron and beta carotene galangal is appreciated for both its medicinal qualities and taste in Thai cooking. 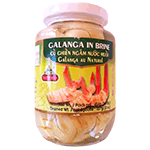 Pickled Galangal Root can be enjoyed as a condiment or used in cooking when fresh is not available. Product of Thailand.